Ashland Institute of Massage is located in Ashland, Oregon, a picturesque town of 20,000 nestled in the southern Rogue River Valley at the confluence of the Klamath, Siskiyou, and Cascade mountain ranges. 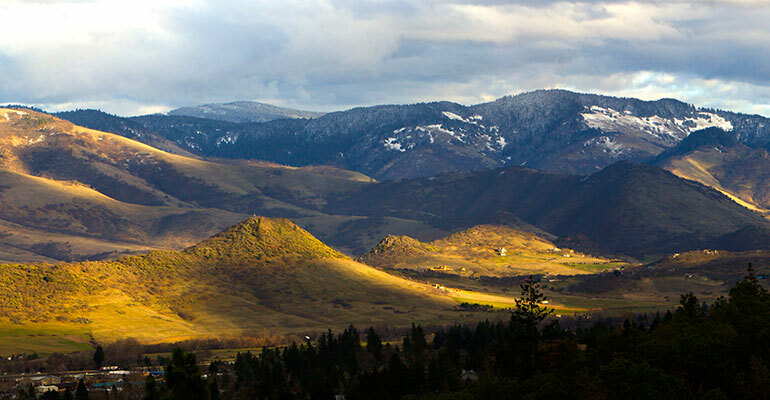 Ashland has a sunny climate, moderate rainfall, and four beautiful seasons. Home to Southern Oregon University and the nationally renowned Oregon Shakespeare Festival, Ashland is known for its small-town ambiance, superb restaurants, abundant music and theatre venues, and access to incredible outdoor recreational opportunities. Hiking, skiing, kayaking, and mountain biking are all easily accessible from town. We are 90 minutes away from Mt. Shasta and Crater Lake National Park, two-and-a-half hours from the Pacific Ocean, and less than a six-hour drive to Portland or San Francisco. Ashland is a safe, health-conscious, and progressive community. As a mecca for cutting-edge alternative health care, Ashland draws highly skilled bodywork professionals, making a culture of exceptional bodywork the norm. It is from this field of professionals that we draw our staff, all of whom are active practitioners. Students are likely to find mentors in many fields of interest in this rich community. AIM’s standard of educational excellence thrives with this level of expertise and support. For more information on Ashland and the surrounding area, call the Ashland Chamber of Commerce at 541.482.3486 or visit their website. You may also wish to contact the Chamber of Commerce of Medford/Jackson County at 541.779.4847 or visit their site.